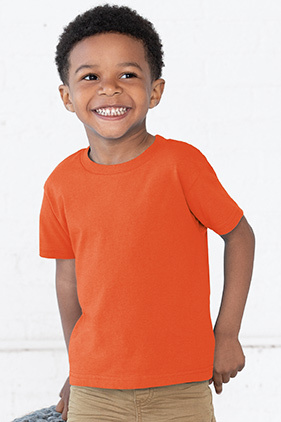 A playtime favorite - these kids t-shirts for toddlers are durable yet soft and comfortable. Made from 100% cotton, this jersey provides a soft feel that is perfect for sensitive skin. 100% cotton 5.5 ounce jersey knit toddler/juvy t-shirt. Ribbed collar supports the neckline to maintain the proper shape. Shoulder-to-shoulder taping reinforces the fabric to prevent overstretching, providing long lasting wear. Double needle hem sleeves and bottom for a clean, finished look. Side seam construction for exceptional quality and durability. EasyTear™ label for additional comfort. CPSIA compliant tracking label in side seam. Ash and White are sewn with 100% cotton thread. (Ash 99/1, Heather 90/10).